The ITIL Story. Pink Elephant. The contents of this document are protected by copyright and cannot be reproduced in any manner. 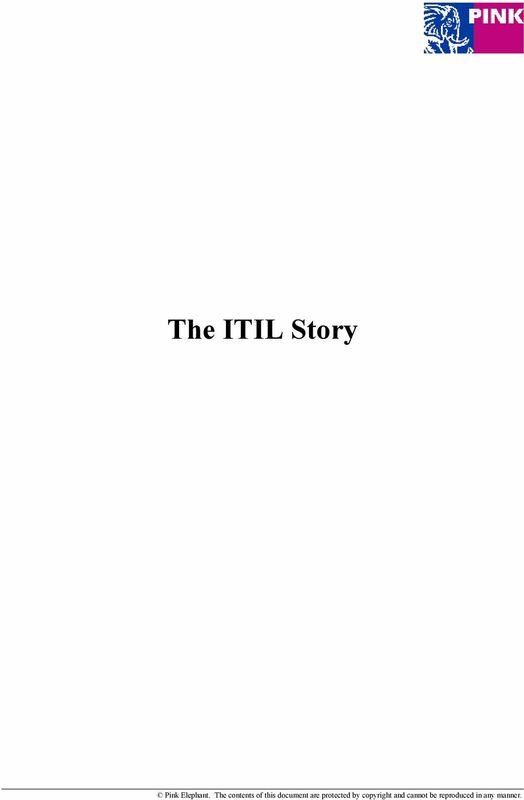 Download "The ITIL Story. Pink Elephant. The contents of this document are protected by copyright and cannot be reproduced in any manner." 2 1. ITIL Defined The Information Technology Infrastructure Library (ITIL) is a set of guidance developed by the United Kingdom s Office Of Government Commerce (OGC). The guidance, documented in a set of books, describe an integrated, process based, best practice framework for managing IT services. To date, these books are the only comprehensive, non-proprietary, publicly available guidance for IT Service Management. ITIL was conceived in the late 1980s. It was originally initiated to improve IT Service Management at the UK central government, however it is relevant to all organizations; public or private sector, large or small, centralized or distributed. Today, ITIL represents more than books alone. It has generated an entire industry that includes: Training Certification Consulting Software Tools Trade Associations 2. 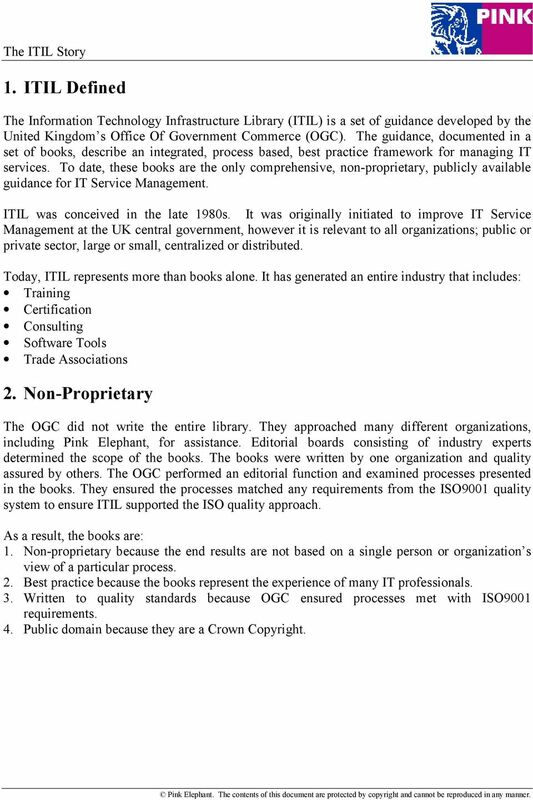 Non-Proprietary The OGC did not write the entire library. They approached many different organizations, including Pink Elephant, for assistance. Editorial boards consisting of industry experts determined the scope of the books. The books were written by one organization and quality assured by others. The OGC performed an editorial function and examined processes presented in the books. They ensured the processes matched any requirements from the ISO9001 quality system to ensure ITIL supported the ISO quality approach. As a result, the books are: 1. Non-proprietary because the end results are not based on a single person or organization s view of a particular process. 2. Best practice because the books represent the experience of many IT professionals. 3. Written to quality standards because OGC ensured processes met with ISO9001 requirements. 4. Public domain because they are a Crown Copyright. 3 3. Concepts Behind The Library IT service in organizations is usually provided by an internal department (known as the IT organization) and consists of an IT Infrastructure. The IT infrastructure is a term used to describe hardware, software, procedures, computer-related communications, documentation and skills required to support IT services. These components and their use must be managed -- hence the term IT infrastructure management. 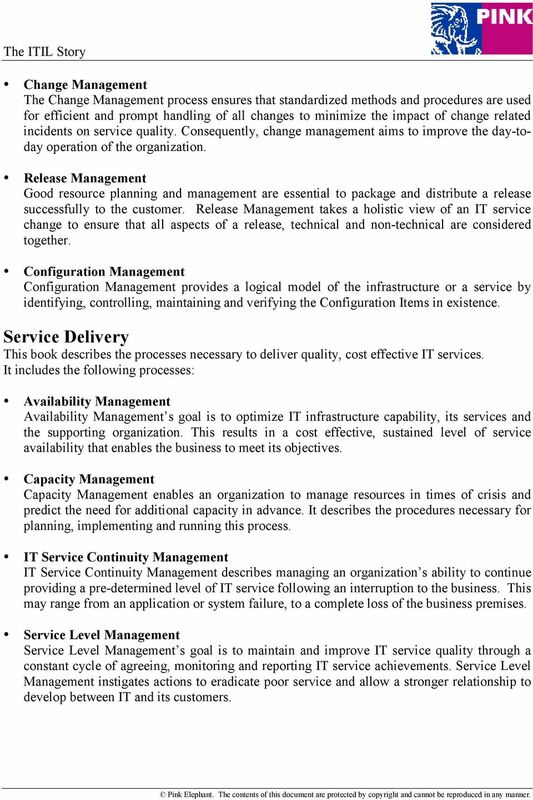 Overall, IT services and management of the IT infrastructure is referred to as IT Service Management. However, the terms IT Service Delivery and IT System Management are also commonly used to describe this function. 4. Books In The Library The seven book series guides business users through the planning, delivery and management of quality IT services. At a time of increasing dependence on IT, the series is an essential reference source for IT professionals. Two books, Service Support and Service Delivery describe key processes IT organizations must have in place to provide quality IT services for its customers. Service Support reviews a function and the operational processes. Service Delivery reviews the tactical processes. 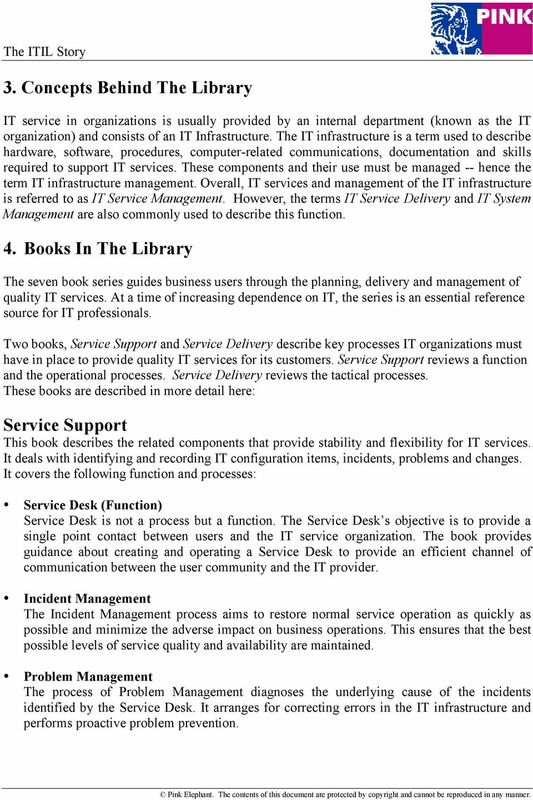 These books are described in more detail here: Service Support This book describes the related components that provide stability and flexibility for IT services. It deals with identifying and recording IT configuration items, incidents, problems and changes. It covers the following function and processes: Service Desk (Function) Service Desk is not a process but a function. The Service Desk s objective is to provide a single point contact between users and the IT service organization. The book provides guidance about creating and operating a Service Desk to provide an efficient channel of communication between the user community and the IT provider. Incident Management The Incident Management process aims to restore normal service operation as quickly as possible and minimize the adverse impact on business operations. This ensures that the best possible levels of service quality and availability are maintained. Problem Management The process of Problem Management diagnoses the underlying cause of the incidents identified by the Service Desk. It arranges for correcting errors in the IT infrastructure and performs proactive problem prevention. 4 Change Management The Change Management process ensures that standardized methods and procedures are used for efficient and prompt handling of all changes to minimize the impact of change related incidents on service quality. Consequently, change management aims to improve the day-today operation of the organization. Release Management Good resource planning and management are essential to package and distribute a release successfully to the customer. Release Management takes a holistic view of an IT service change to ensure that all aspects of a release, technical and non-technical are considered together. Configuration Management Configuration Management provides a logical model of the infrastructure or a service by identifying, controlling, maintaining and verifying the Configuration Items in existence. Service Delivery This book describes the processes necessary to deliver quality, cost effective IT services. It includes the following processes: Availability Management Availability Management s goal is to optimize IT infrastructure capability, its services and the supporting organization. This results in a cost effective, sustained level of service availability that enables the business to meet its objectives. Capacity Management Capacity Management enables an organization to manage resources in times of crisis and predict the need for additional capacity in advance. It describes the procedures necessary for planning, implementing and running this process. IT Service Continuity Management IT Service Continuity Management describes managing an organization s ability to continue providing a pre-determined level of IT service following an interruption to the business. This may range from an application or system failure, to a complete loss of the business premises. Service Level Management Service Level Management s goal is to maintain and improve IT service quality through a constant cycle of agreeing, monitoring and reporting IT service achievements. Service Level Management instigates actions to eradicate poor service and allow a stronger relationship to develop between IT and its customers. 5 Financial Management For IT Services Financial Management is the sound stewardship of the organization s monetary resources and supports the enterprise in planning and executing its business objectives. Within an IT organization this process is visible in three main areas: Budgeting, IT accounting and charging. Security Management This book covers security from the service provider standpoint and identifies how security management relates to the IT Security Officer. The Business Perspective Set This series of three books addresses issues associated with IT that the business manager may have to deal with. The books are: 1. In Times Of Radical Change This book addresses the issue of rapid and radical business change and its impact on IT. Its purpose is to help to control IT and to integrate it with the business. 2. Surviving IT Infrastructure Transitions IT infrastructure changes can impact the manner in which business is conducted or the continuity of business operations. It is important that business managers take notice of these changes and ensure that steps are taken to safeguard the business from adverse side effects. This book is designed to help business and IT managers address their worst fears about IT transitions. 3. Understanding And Improving This guide provides the business manager with the awareness and insight needed to play a part in ensuring the right quality of IT support is available for the business processes of the organization. It describes the responsibilities and opportunities available to the business manager to improve what is, in most organizations one of the key contributing services to business efficiency and effectiveness. ICT Infrastructure Management Covers Network Service Management, Operations Management, Management of Local Processors, Computer Installations and Acceptance, and for the first time Systems Management. Applications Management Covers Software Lifecycle support, testing of IT services and business change with emphasis placed on clear requirement, definition and implementation of solutions to meet business user needs. 8 that they can understand their relationship with IT service managers and ensure that requirements are incorporated into new and revised products and services from the outset. The guidance is useful to any size of organization, in both the public and private sectors. The books intentionally describe functions and staff roles rather than work groups and job titles, so that the guidance can be applied to organizations of various sizes. 8. Benefits Of Using The ITIL Framework ITIL offers a systematic, professional approach to the management of IT service provision. Adopting its guidance can provide benefits such as: Increasing customer satisfaction with IT services Reducing the risk of not meeting business requirements for IT services Reducing costs when developing procedures and practices within an organization Better communication and information flows between IT staff and customers Standards and guidance for IT staff Greater productivity and better use of skills and experience A quality approach to IT services There are also benefits to the customer of IT services, such as: Reassurance that IT services are provided in accordance with documented procedures that can be audited The ability to depend upon IT services, enabling the customer to meet business objectives The identification of contact points for enquiries or discussions about changing requirements The knowledge that information is produced to justify charges for IT services and to provide feedback from monitoring of service level agreements ITIL emphasizes the importance of providing IT services to satisfy business needs in a cost effective manner. Many IT organizations are attempting to become more customer oriented to demonstrate their contribution to the business. The library can help IT organizations achieve this. Organizations are encouraged to adapt the guidance to suit their needs. They are however, cautioned against omitting activities without due consideration, since IT Service Management is a set of integrated and coordinated functions. Organizations are likely to gain most benefit -- in the longer term -- from implementing all of the functions rather than some discrete functions. ITIL provides a consistent and comprehensive approach to service management ranging from software products to consultancy, training and qualifications. The common approach brings with it a common language of ITIL terms, which permits better communication between IT and suppliers. 9 9. Frequently Asked Questions Q. Are the books available in electronic format? A. The books are available on CD ROM and in the future they will be available at: Q. What is the difference between ITIL and ISO9001? A. ISO9001 is a Quality Assurance process that essentially asks, Are you doing what you say you are doing? 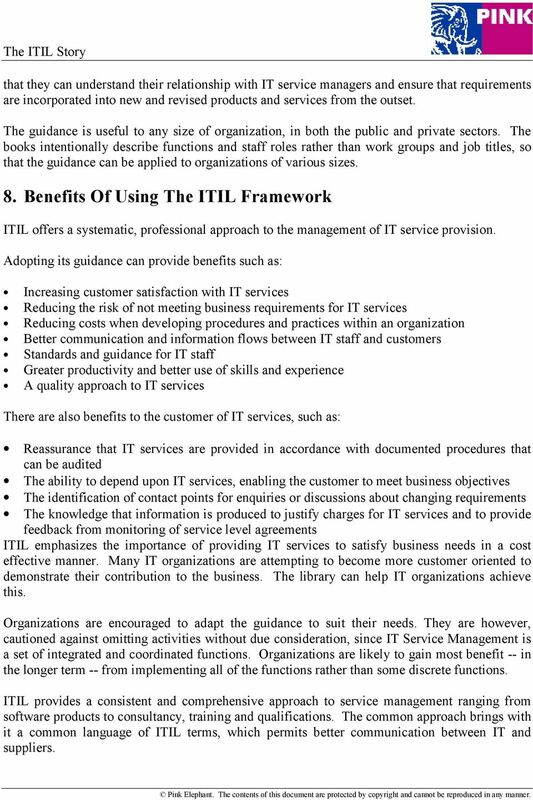 whereas ITIL defines what you should be doing in the first place. Q. 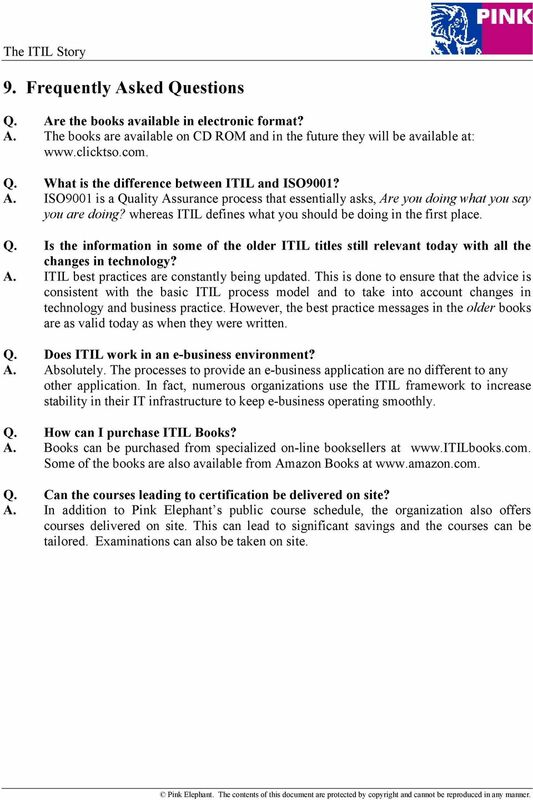 Is the information in some of the older ITIL titles still relevant today with all the changes in technology? A. ITIL best practices are constantly being updated. This is done to ensure that the advice is consistent with the basic ITIL process model and to take into account changes in technology and business practice. However, the best practice messages in the older books are as valid today as when they were written. Q. Does ITIL work in an e-business environment? A. Absolutely. The processes to provide an e-business application are no different to any other application. In fact, numerous organizations use the ITIL framework to increase stability in their IT infrastructure to keep e-business operating smoothly. Q. How can I purchase ITIL Books? A. Books can be purchased from specialized on-line booksellers at Some of the books are also available from Amazon Books at Q. Can the courses leading to certification be delivered on site? A. In addition to Pink Elephant s public course schedule, the organization also offers courses delivered on site. This can lead to significant savings and the courses can be tailored. Examinations can also be taken on site. 10 Pink Elephant Pink Elephant is a respected IT service management provider with more than 20 years of experience. We specialize in Information Technology Infrastructure Library (ITIL) education, conferences, consulting and managed services. Pink Elephant also has offices in Australia, New Zealand, Malaysia, Singapore and Hong Kong. 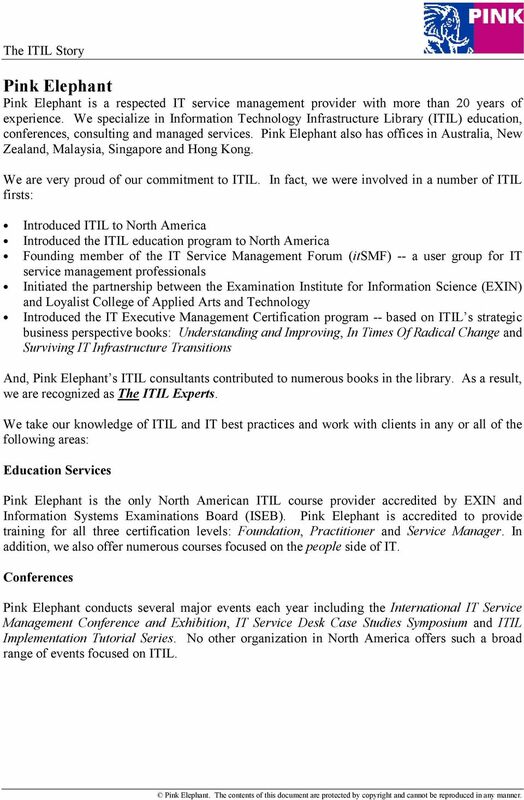 We are very proud of our commitment to ITIL. In fact, we were involved in a number of ITIL firsts: Introduced ITIL to North America Introduced the ITIL education program to North America Founding member of the IT Service Management Forum (itsmf) -- a user group for IT service management professionals Initiated the partnership between the Examination Institute for Information Science (EXIN) and Loyalist College of Applied Arts and Technology Introduced the IT Executive Management Certification program -- based on ITIL s strategic business perspective books: Understanding and Improving, In Times Of Radical Change and Surviving IT Infrastructure Transitions And, Pink Elephant s ITIL consultants contributed to numerous books in the library. As a result, we are recognized as The ITIL Experts. We take our knowledge of ITIL and IT best practices and work with clients in any or all of the following areas: Education Services Pink Elephant is the only North American ITIL course provider accredited by EXIN and Information Systems Examinations Board (ISEB). Pink Elephant is accredited to provide training for all three certification levels: Foundation, Practitioner and Service Manager. In addition, we also offer numerous courses focused on the people side of IT. Conferences Pink Elephant conducts several major events each year including the International IT Service Management Conference and Exhibition, IT Service Desk Case Studies Symposium and ITIL Implementation Tutorial Series. No other organization in North America offers such a broad range of events focused on ITIL. 11 Consulting Using the ITIL best practice approach to IT Service Management as a springboard, Pink Elephant provides end-to-end consulting services. This means that from assessment to strategic planning to implementation and beyond, our experienced consultants work hand-in-hand with you every step of the way. Together, you follow ITIL s process improvement model to answer these important questions: 1. Where are we now? 2. Where do we want to be? 3. How do we get where we want to be? 4. How do we know when we ve arrived? As a result, you receive the measurements and analysis needed to define your current IT department. You also discover the areas in which you are currently successful and how to leverage those opportunities to less mature areas of your IT business. Additionally, Pink Elephant works with you on improvement initiatives at the strategic, tactical and operational levels, assisting you to become an efficient, process-based IT delivery organization. 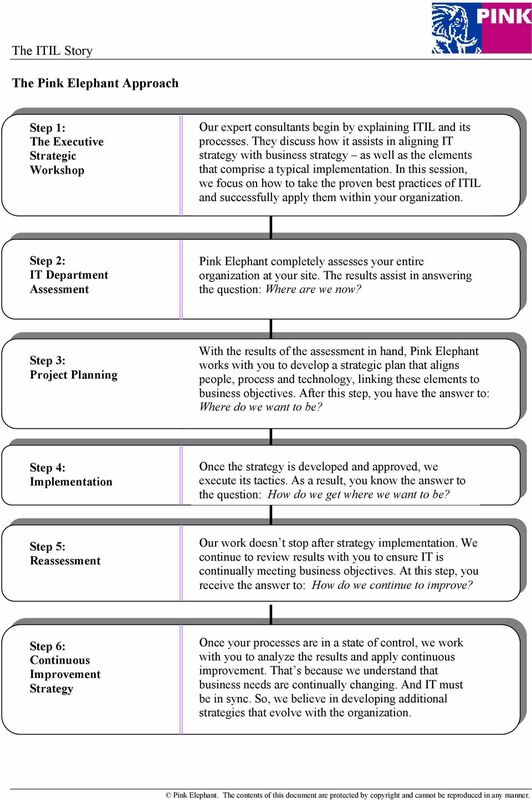 12 The Pink Elephant Approach Step 1: The Executive Strategic Workshop Our expert consultants begin by explaining ITIL and its processes. They discuss how it assists in aligning IT strategy with business strategy as well as the elements that comprise a typical implementation. In this session, we focus on how to take the proven best practices of ITIL and successfully apply them within your organization. Step 2: IT Department Assessment Pink Elephant completely assesses your entire organization at your site. The results assist in answering the question: Where are we now? Step 3: Project Planning With the results of the assessment in hand, Pink Elephant works with you to develop a strategic plan that aligns people, process and technology, linking these elements to business objectives. After this step, you have the answer to: Where do we want to be? Step 4: Implementation Once the strategy is developed and approved, we execute its tactics. As a result, you know the answer to the question: How do we get where we want to be? Step 5: Reassessment Our work doesn t stop after strategy implementation. We continue to review results with you to ensure IT is continually meeting business objectives. At this step, you receive the answer to: How do we continue to improve? Step 6: Continuous Improvement Strategy Once your processes are in a state of control, we work with you to analyze the results and apply continuous improvement. That s because we understand that business needs are continually changing. And IT must be in sync. So, we believe in developing additional strategies that evolve with the organization. ITIL: What is it? How does ITIL link to COBIT and ISO 17799? IBM and the IT Infrastructure Library. The ITIL Service Desk. Common Sense Comes To Life. Version : 1.3 Date : August 13, 2003 : Pink Elephant Global Hosting Services www.pinkghost. Getting In-Control - Combining CobiT and ITIL for IT Governance and Process Excellence. Executive Summary: What is the business problem? Introduction to The IT Infrastructure Library (ITIL) Fox IT, LLC. All rights reserved. Use product solutions from IBM Tivoli software to align with the best practices of the Information Technology Infrastructure Library (ITIL). ISO 20000: What s an Organization to Do? IT Organisation in Change ENTERPRISE SOFTWARE ENGINEERING & SOFTWARE ENGINEERING IN THE ENTERPRISE IT change Quality of IT s Costs of IT s change Future Now Perfect IT s Business Demands Can we deliver? 2. Encourage the private sector to develop ITIL-related services and products (training, consultancy and tools). 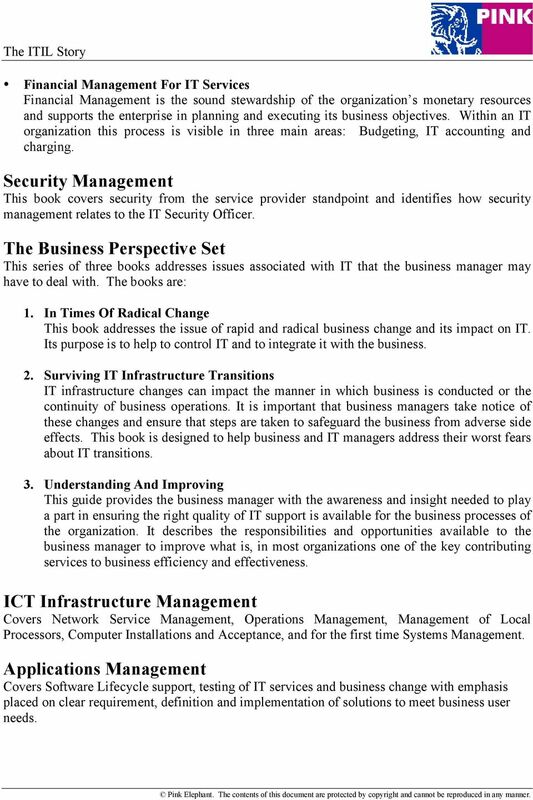 This volume is related to the topics of IT Governance and IT Portfolio Management. 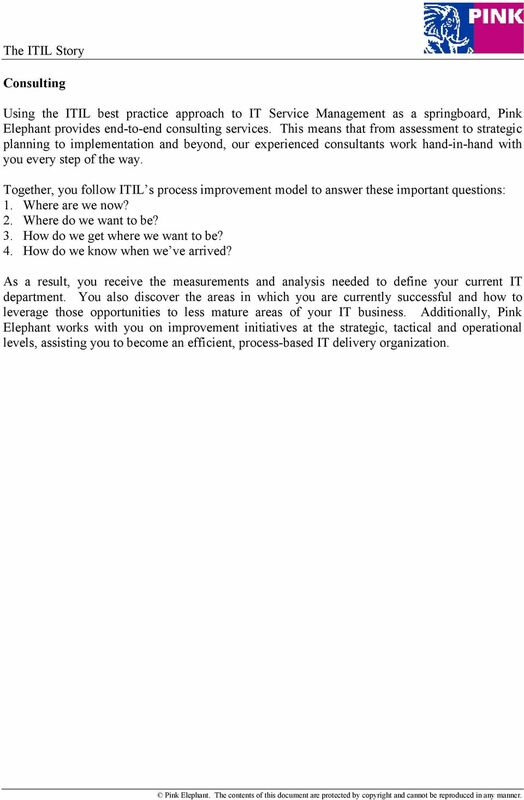 ITIL Update: By Kirk Holmes Holmes and Associates, Inc. Presented March 5, 2008. 2008 Holmes and Associates, Inc. 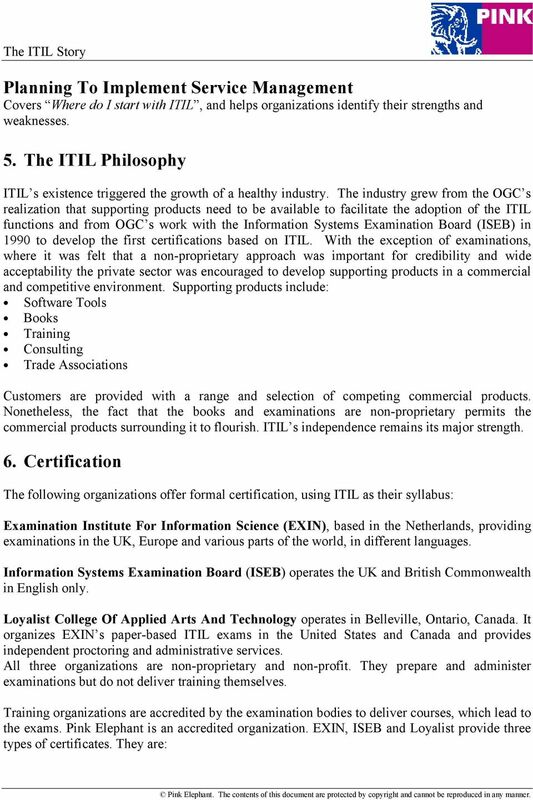 Accredited ITIL elearning courses Contents Introducing ITIL. 3 Available now!. 4 ITIL 2011 Foundation elearning. 5 ITIL Intermediate level. 7 ITIL 2011 Intermediate: Service Strategy Premium elearning. Contents. viii. 4 Service Design processes 57. List of figures. List of tables. OGC s foreword. Chief Architect s foreword. Preface. 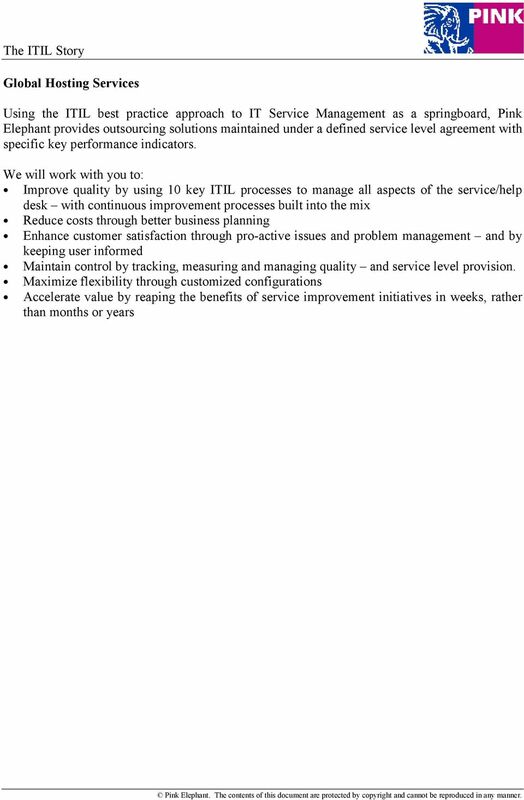 The Value of ITIL to IT Audit HP Suen Chairman 9 August 2005 IT Infrastructure Library 1 ITIL Best practice in IT Service management, developed by Office of Government Commerce (OGC), UK in the late 1980s. Measuring ITSM Are Your Processes Making The Grade? CGI s Global Infrastructure Services Bringing our best to your table cgi.com 2 CGI delivers Best value global delivery, providing immediate access to resources through delivery centers across four continents. Cisco Unified Communications and Collaboration technology is changing the way we go about the business of the University. By Ramon Smitherman, Dream Catchers, Inc. Executive Summary Many companies today are in the mode of buying technology and then figuring out how to adopt their operations to fit its processing requirements.